Banjo heads effect the sound projected by the banjo. We have a wide variety of Deering and Remo replacement banjo heads on sale. You will find top frosted banjo heads, bottom frosted banjo heads, clear banjo heads, and a few specialty banjo heads. We keep many sizes and types of banjo heads in stock and can get them to you quickly. If you are looking for a custom size banjo head, please call Customer Service at 648-888-BANJO and we will order your special banjo head size. The Coated Diplomat is slightly warmer than the Clear Diplomat due to a thin layer of coating on the single ply of Mylar film. They're known for their bright warm tones, resonance, and sustain. Replacment Banjo Head, Fiberskyn, 11" Diameter, High Collar The Fiberskyn Diplomats have warm tones due to a poly-spun fiber single layer of Mylarr film. They're known for their warm full tones, resonance, and sustain. 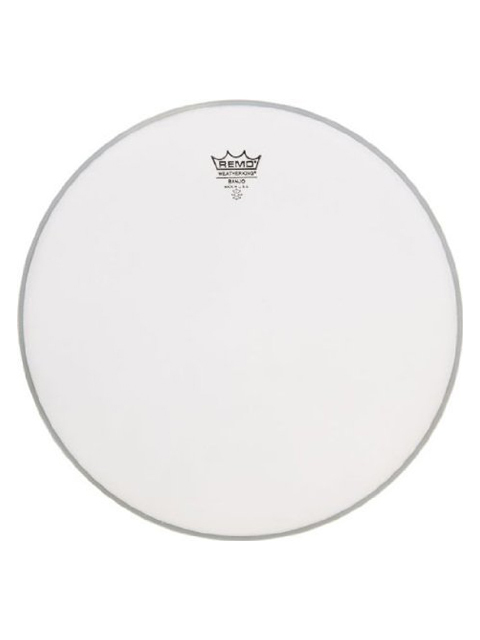 The Clear Diplomat is Remo's brightest, most open sounding head due to its single layer of Mylar film. The Renaissanceå Diplomatå is slightly warmer than Clear Diplomatså due to a textured surface on the single layer of Mylarå film. Theyre known for their rich warm tones, resonance and tone. The Deering prism banjo head has a showy appearance and a bit like the black head in tone - but brighter. A popular head for tenor, plectrum, and Crossfire electric banjos both for tone and appearance. Banjo heads effect the sound projected by the banjo. We carry a wide variety of Deering and Remo replacement banjo heads. You will find top frosted banjo heads, bottom frosted banjo heads, clear banjo heads, and a few specialty banjo heads. We keep many sizes and types of banjo heads in stock and can get them to you quickly. If you are looking for a custom size banjo head, please call Customer Service at 648-888-BANJO and we will order your special banjo head size. If you are looking for a custom size banjo head, please call Customer Service at 648-888-BANJO and we will order your special banjo head size.